Apiaceae - carrot family Dicot. The olive groves of the deep valley above Glysteri are filled in springtime with lacy white flowers amongst the lush green spring grasses. 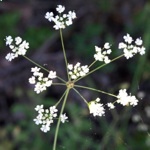 These are the flowers of the Apiaceae family and it can be difficult to differentiate the various species, as when they are in flower they appear to be very similar. In the early months Scaligeria napiformis is most abundant. It can be identified by the seeds, which are smooth and shiny, arranged in pairs. The leaves are finely divided and resemble parsley and have similar culinary uses, they are one of many plants collected by Skopelitians as horta.